Nepal Foreign Affairs (KATHMANDU, 24 October 2018) – Deputy Prime Minister and Defence Minister Ishwor Pokhrel has expressed the belief that the friendly relations subsisting between Nepal and the People’s Republic of China would be more fruitful and deeper in the days ahead. 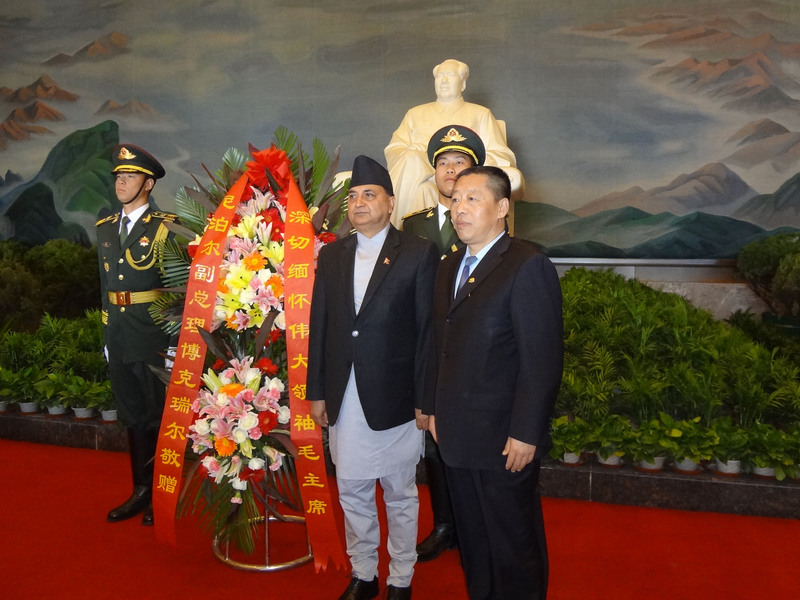 PM Pokhrel, who is currently in China to attend the international military conference to be held in Beijing, said this after laying a wreath and paying tributes to Mao Zedong, the founder chairman of the Communist Party of China and the leader of the Chinese Revolution, at the late leader’s memorial at Tiananmen Square in Beijing today. On the occasion, Deputy Prime Minister Pokhrel also recalled the contribution made by the late Chinese leader in expanding friendly relations and cooperation between Nepal and China, the DPM’s press coordinator Lokendra KC said. Deputy Prime Minister and Minister for Defence, Pokhrel will take part in the Beijing Xiangsten Forum. The forum is an international military conference and DPM Pokhrel is attending the event at the invitation of Chinese Defence Minister Wei Fenghe. In the forum, he will speak on ‘UN peace keeping mission: challenges and cooperation’ amidst the participation of 15 defence ministers, 40 army chiefs and delegates from 100 countries. It is stated that an agreement on China’s assistance of 150 million Chinese Yuan to the Nepalese Army for mobilization in disaster management will also be signed during the Defence Minister’s visit.